The enduring photo for Americans of 9/11 will not be the images of catastrophe. Instead, the image of the three New York City firemen hoisting the American flag at Ground Zero just hours after the worst-ever attack on U.S. territory remains the most enduring image from that horrific day — and is among the most inspirational tableaux in the country's history. The historic photo, taken by Thomas Franklin of The Record of North Jersey, conjures up two of America's most moving battle icons — the victorious World War II flag-raising at Iwo Jima and the National Anthem's defiant lyric celebrating the country's resiliency under attack: " . . . the bombs bursting in air gave proof through the night that our flag was still there." 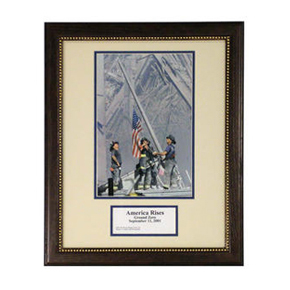 Now you can share and celebrate the courage of the heroes of 9/11, America's indomitable spirit and our flag — by ordering Newsmax's unique "America Rises" framed photograph. This cherry colored wood frame is suitable for home and office. The striking portrait is complimented by commemorative plate inscribed with: American Rises, Ground Zero, September 11, 2001 and measures 12¾" x 15¾". This image was personally chosen by President Bush to appear on a U.S. stamp — the first time living persons have been so depicted. This "America Rises" framed photograph offered by NewsMax has been officially accepted and licensed by the Bravest Fund and the three heroic firemen depicted. 100 percent of royalties for the picture are donated to The Bravest Fund and the North Jersey Media Group Disaster Relief Fund. The Bravest Fund is a non-profit fund organized by the three firefighters — Dan McWilliams, George Johnson and Billy Eisengrein — to benefit firemen and their families who were victims of 9/11. Though families of the 343 firefighters who died on 9/11 may receive death benefits for their lost ones, these firemen's families may not have the same claim to government benefits as others who perished in the disaster. And many of the countless rescue workers — firemen, police and the other emergency responders — who survived 9/11 or who worked on disaster relief after 9/11 have suffered injuries, but have received little or no benefit. Many of the rescuers now suffer from respiratory problems. In more than a few cases, those health problems have already ended careers. By ordering this "America Rises" framed photo, you will not only celebrate America and her greatness — but also help a great cause — The Bravest Fund! By donating to The Bravest Fund, you will not only honor and help our heroes and their families — you will be paying tribute to all the brave FDNY men and women who gave the ultimate sacrifice on 9/11 — and are not forgotten years later.